Erm.. ceritanya gini.. Last friday morning, we sent her to makcik babysitter... and we both went to work.. So, without any delay, we rushed to Saujana Utama.. picked Alia.. and went to Putra MEdical Centre. It was the one and only private hospital in our area (that i know of.. haha) **Actually tujuan pergi ke hospital was that i had a hunch that Alia might be warded..
Ok, back to Alia.. so the Dr said that Alia was having an Acute Tonsilitis ... (tonsil pun ada acute eh..?) erm. so that's why she refused to eat / drink, and this resulted her sudden fever. 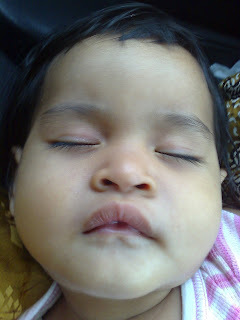 Dr said that after given antibiotics for 2 or 3 days, she should be ok.. :) Alhamdulillah.. So, after that, PATUTNYA I went home and take care of my lil baby, rite..? So.... we went to PSN... Dah alang2 di PSN.. so, i joined the workshop back..
That nite, Alia had a temperature again..! Adui.. dah bagi ubat demam (liquid) ikut time.. tapi, tiba2 panas pula.. so, after 4 hrs, we gave her the ubat demam (the one yang cucuk ikut bont0t tu..).. Actually Dr mmg dah ramal, akan jadi suhu fluctuate gini.. tu yg dia bekalkan.. hehe.. So, initial plan was, the day after that (Saturday) we were supposed to go to Bruas.. erm.. beraya di sana.. tp i was worried with Alia's condition.. but Mr Hubby bertegas nak balik kampung dia juga.. haha..
Oh ya, Opah Alia dan Wan Bruas masak lemang, dengan rendang ayam dan rendang daging.. Since that ibu Alia mmg x berapa favour of lemang.. so ibu ALia makan lauknya saja.. haha..
Tuesday (that's today..) Ibu Alia and Ayah Alia plus Alia.. went home.. oh ya, before that, early in the morning we (the 3 of us) and Ely + Ika went to Jaya Jusco AU2.. wee...! seronok! oh well, x la seronok mana, biasa je.. but seronok pasal JJ ni baru open last friday.. so kami ni kira orang yang terawal la melawat JJ ni.. haha.. The best part was... i bought THIS! Thankgod dah baik demamnya. alhamdulillah Ammar pun dah OK. Haha mamar ammar tak reti la bab2 bawak susu naik katerbang ni..
err...saya penah bawak susu and air panas masuk flight air asia to KB and dorang bagi. tapi, susu tu, saya tak de la bawak satu tin besar, saya dah letak siap2 ikut sukatan dalam bekas susu tu. susah2, mintak jer air panas dgn FA. saya pernah mintak dorang tolong panaskan susu. hihi. Hi, my name is Guckigh. I like [url=http://onlinecasino-ru.ru/full-poker.php]Full покер[/url]. I know thats best subject. I need new ideas for [url=http://onlinecasino-ru.ru/zarabotok-v-internete-bez-vlojeniy-forum.php]Заработок в интернете без вложений форум[/url]. Its just really hard find for me [url=http://onlinecasino-ru.ru/deshevie-nabori-dlya-pokera.php]Дешевые наборы для покера[/url] to nifiga sebe text [url=http://onlinecasino-ru.ru/mir-azartnih-igr.php]Мир азартных игр[/url]. Can you help, please? I am tired of being like this [url=http://onlinecasino-ru.ru/komplektuyshie-dlya-igrovih-avtomatov.php]Комплектующие для игровых автоматов[/url]. I find some more information at the Beginner's Lohpaket 2010 [url=http://onlinecasino-ru.ru/zarabotat-v-internete-zapolneniem-anket.php]Заработать в интернете заполнением анкет[/url].